The old temples of Karnataka’s Hassan district are an architectural wonder. And the town of Belur is home to one of the grandest examples of Hoysala architecture, the Chennakesava Temple (Also Chennakeshava). The temple was built in the early 12th century by the Hoysala ruler, Vishnuvardhana, when the town of Belur was the site for the capital of the Hoysala kingdom. 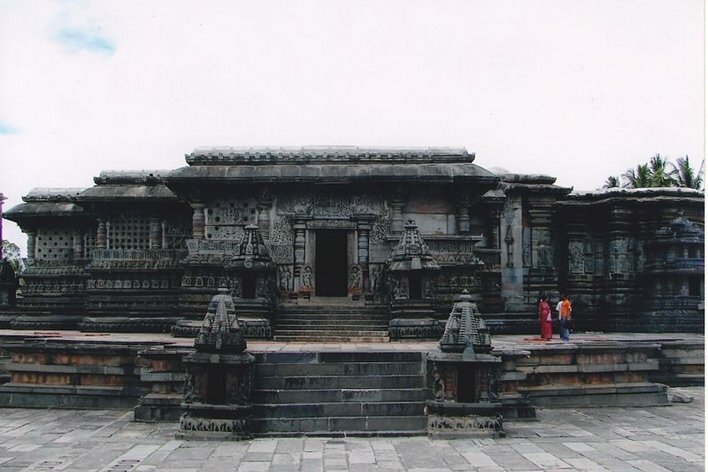 The Hoysalas ruled the region for more than three centuries and to this day people from all over the region flock to the Chennakesava Temple, Belur to admire the intricate works of art and sculpture and feel the old-world spiritual charm of the site. The Chennakeshava Temple was a centrepiece of the Hoysala kingdom and it is believed to be closely related to the military achievements of the king who commissioned it in 1117 AD, King Vishnuvardhana. The king had fought wars with the Western Chalukyas and had also defeated the Cholas. The temple was built after the land’s best architects and artists were recruited and engaged in producing new designs and styles that would be the hallmark of the complex. Just like the other landmarks of Hassan, Chennakeshava Temple, Belur is considered one of the peaks of architectural achievements during the Hoysala period. As one enters this vast complex, a large rajagopura or gate arches above. The centre-piece the temple sits in the centre, facing the east, following the most followed orientation of temple architecture. On the right of the temple is the Kappe Channigraya temple and a smaller temple dedicated to a Lakshmi reincarnation, the goddess Sowmyanayaki, sits slightly behind the two. On the left of the Chennakeshava temple, one can find the Ranganayaki temple. Attractions in the temple complex include two ornate pillars, one of the Garuda and one with a lamp. The former was built during the Vijaynagar period and the latter is attributed to the Hoysala period. Built with soapstone, the Chennakesava temple features a very detailed finish built around a typical Hoysala style blueprint. The temple’s scale is what distinguishes it from many other temples of the Hoysala period and it is considered to be one of the earliest creations of the dynasty. At its highest, the temple stands 37 metres tall. 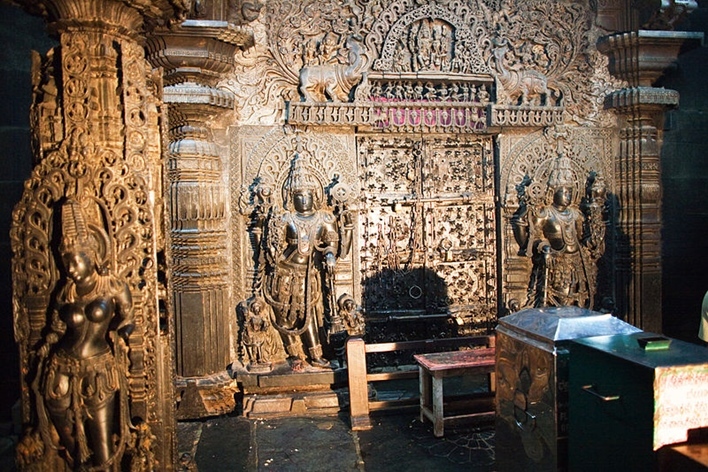 Its outer walls are adorned with finely done artwork, with dancing girls in various postures. The pillars of the temple exhibit some of the best details and finishing of sculpture and art work in the entire complex. The Narasimha pillar is one of the most popular of these temple pillars. 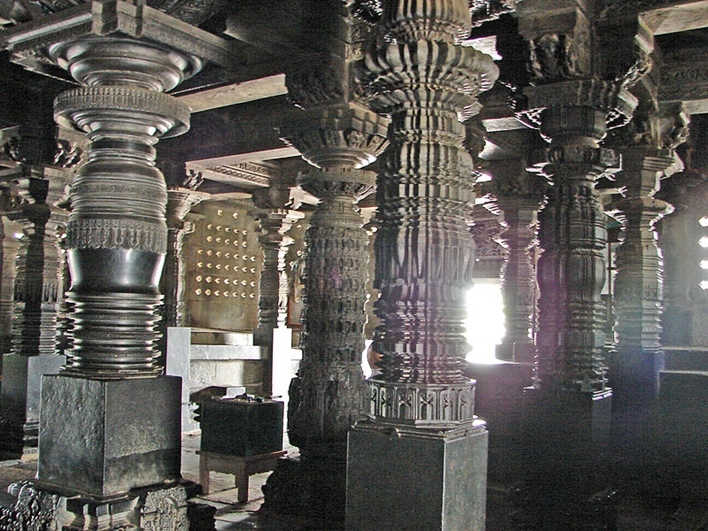 There are a total of 48 pillars, all uniquely carved and decorated. The four central pillars were hand chiselled by artisans and feature madanikas or celestial damsels. The madanikas are in different poses and some of the popular ones which gain the attraction of tourists and art enthusiasts include the lady with a parrot and the huntress. Visitors who are keen to study the details of the wall sculptures at the Temple will find many references and depictions of important events from the Mahabharata and the Ramayana. A careful observation would reveal subtle pieces of eroticism hidden amidst the detailed depictions. Animals that commonly feature in the wall sculptures include horses, elephants and lions. The doorways of the temple’s mantapa features a Hoysala king slaying what historians believe is either a tiger or lion. It is also believed that this could be a symbolic representation of the defeat of the Cholas, whose royal emblem is a tiger. There are many more important sculptures in the sprawling complex of the Temple. Some of them are the Gajasurasamhara (sculpture of Lord Shiva), a sculpture of Ravana, Durga killing Mahishasura and many others. There are multiple mini shrines too at the entrance of the temple. Another curious feature of these many sculptures is the signatures left by the artists of the period, giving us more insight into the lives and culture during the Hoysala period. Belur is where Chennakesava Temple is located so all transit routes need to go via the town. The other major urban areas around the temple include Hassan city. The Mangalore Airport is around 130 kilometres from Belur, while Bangalore International Airport is around 222 kilometres away. From the airports, the most ideal choice of travel is by road. 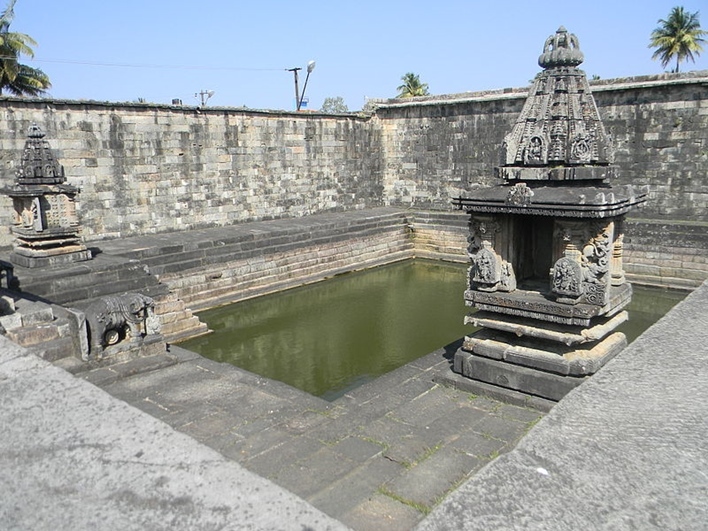 The nearest railway station to the town of Belur is in Chikmagalur, which is 22 kilometres away. Hassan railway station is around 32 kilometres away from Belur town. There are many buses that ply between these towns. Bangalore city is 220 kilometres away from Belur via the NH75. If one is travelling from Mysore, the journey is 155 kilometres long via the SH 57. The coastal city of Mangalore is 153 kilometres away via the NH73. There are regular buses that ply to Belur from Hassan, Chikmagalur, Bangalore, Mysore and Mangalore. The importance and cultural contribution of the Hoysala Dynasty to the region that is now Karnataka is immense. A visit to this vibrant state is incomplete without witnessing the scale of architecture, details and innovative styles that the Chennakeshava temple is famous for. Having recently celebrated 900 years of existence, this complex of structures has seen the many faces and layers of Karnataka’s history. It now quietly and majestically sits on the banks of the Yagachi River, a central attraction and a reminder to visitors of the timeless legacy of one of South India’s most powerful kingdoms.